If the Mediterranean conjures up images of balmy sun drenched days and wearing shorts and T-shirts, today it was at the opposite end of the meteorological spectrum, challenging RC44 Valletta Cup competitors to the maximum. A gale passed across Malta last night and while conditions had abated it wasn't until 1400 local that the wind momentarily dipped below the statutory 25 knots allowing Principal Race Officer Peter Reggio to fire the start gun. Even then a mighty seaway was still running and with the wind piping up mid-race, the penultimate day of competition here was one that the 11 crews will remember for some time, coming ashore soaked to the bone, but with Cheshire cat grins. Torbjörn Törnqvist's Artemis Racing, with British two time Olympic gold medallist Iain Percy calling tactics, led after a bouncy first beat. The Swedish crew kept its cool, hoisting the spinnaker without incident in the big conditions; a feat that some crews further back in the fleet didn't manage. Even Artemis Racing didn't come away unscathed. Törnqvist explained: "Unfortunately just after the hoist, we slammed into a huge wave and the bow came off - slowing us down. Obviously that affected our sailing." (The RC44s are fitted with a sacrificial bow - that is removed for shipping, and isn't integral to the boat's structure). Artemis Racing led into the leeward gate, but Nico Poons' Charisma had caught up. Tactician Ray Davies recounted: "We had a good first run and we got a nice layline into the bottom mark where we had a really good rounding. We dropped [the kite] while we were surfing down a wave, gybed, rounded up and gained a lot." 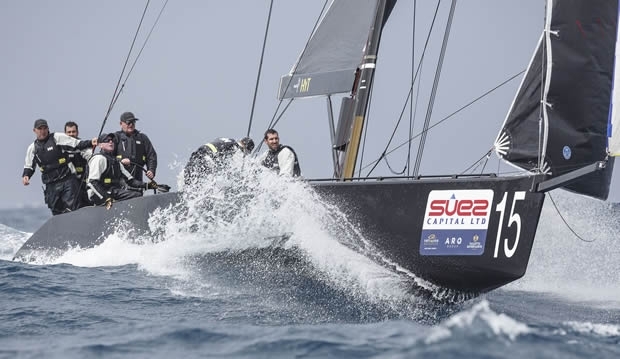 Charisma had overhauled the compromised Artemis Racing on a second lively upwind leg to lead at the weather mark and managed to hang on for a final downhill sleighride to take her first win of the 2015 RC44 Championship Tour. Going into the final day, Charisma is up to second having podiumed in five out of the six races to date leaving her five points off Katusha in the lead. Charisma's owner Nico Poons described his day: "You start a race like this, you survive. It may have looked scary on the downwinds, but I did feel like I had it perfectly under control. As the breeze started picking up more, we were a bit uncomfortable, but only because we were getting so wet." His Emirates Team New Zealand navigator Ray Davies added: "It was epic, cool sailing in the nice big waves. We'd been looking forward to it all day. We are excited to sail in that stuff. Our set-up was fantastic, we boned everything up and Nico kept it in the groove." Unfortunately even some of the top teams suffered. Team CEEREF scored a DNF due to an issue with her steering, while John Bassadone's Peninsula Petroleum broached on the first run. "When we wiped out one of the guys fell in the water. We picked him back up, but he had also hurt himself but he is alright now which is good news," recounted the Gibraltar-based skipper, adding that he had been hoping for more races to allow Peninsula Petroleum to improve on the eighth place where she stands overall at present. "We've raced in tougher conditions and performed quite well, but today we didn't," continued Bassadone. "We were a little bit hesitant. Normally we thrive in these conditions." The overwhelming memory of the day will certainly be the conditions that verged on 'survival', but proved how robust the RC44s are even in big wind and waves. "They are fantastic - that is the beauty of these boats. They are not easy, but even today they were very sailable," said Bassadone. "They were great conditions and very challenging," agreed Torbjörn Törnqvist. "It was on the edge but Luigi [PRO Peter Reggio] made a good call and there were no issues around the course and no blow outs. All the boats handled it very well. It was pretty hairy out there, we couldn't sail downwind as we wanted because of our bow problem, but we had moments of 22 knots of boat speed." Only one race was sailed today before the wind picked up and the fleet was sent home. The aim is to get three races in tomorrow, the final day of the RC44 Valletta Cup, with the first start at 10:30 CET.